Harry's Cafe de Wheels in Parramatta. I have lived overseas for most of my life where the city is alive even after midnight. When I moved to Australia, I settled in a regular sleepy suburb where businesses close at 5PM, save for the neighbourhood Woollies, a bottle shop, and maybe a few pubs. Well, some fancy restaurants are open til late as well, but that's it. There is no place where you can grab a quick bite. After visiting some friends in Parramatta last weekend when the catching up took us until almost midnight, they led me to Harry's Cafe de Wheels along that segment of Church Street between Harold and Fennel Streets. It was a pleasant surprise to find such a haven for people who've just been to a game, a movie, or a night out with beer buddies. It was almost midnight and Harry's was buzzing with business. Harry's has a long history and tradition of good pie. Harry's is an Australian icon, having served hot pies and peas for more than 7 decades now. It has carried on its tradition of quality and original flavour in all its locations. 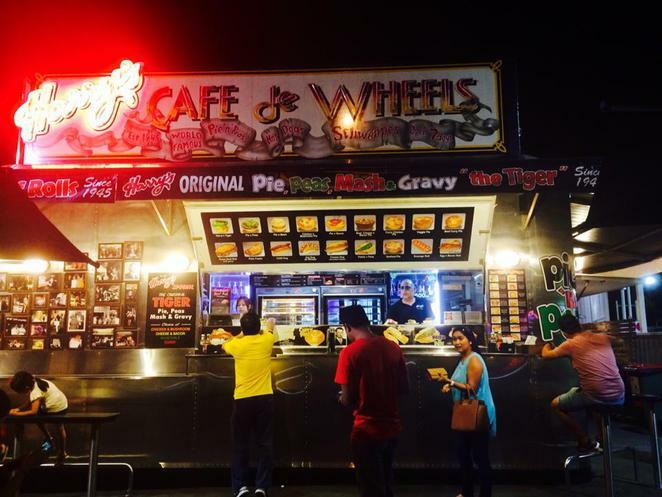 Residents of Bondi, Broadway, Burwood, Haymarket, Liverpool, Newcastle, Parramatta, Penrith, Tempe, Ultimo, Woolloomooloo and neighbouring suburbs are lucky to have a Harry's Cafe de Wheels in their vicinity. KFC's Colonel Sanders is a fan of Harry's. Harry's Tiger is a best seller. Named after Harry 'Tiger' Edwards who founded Harry's Cafe de Wheels in the 1930s, the signature dish consists of chunky lean beef pie served with mushy peas, mash & gravy. Click here for more on Harry's menu. A typical Harry's pie consists of 98% chunks of lean topside, sea salt, pepper, herbs and spices, pastry, flour, butter, organic palm oil, rock salt, and baking powder. The pies are freshly made by hand each day. There is no freezing or frying involved, which makes Harry's a choice not just for the night owl but also for the health buff. The pies and venue looks awesome. I have never seen a mobile restaurant quite so big. absolutely an historic Aussie icon. Always loved this place. Glad to see it's thriving :) Good job.